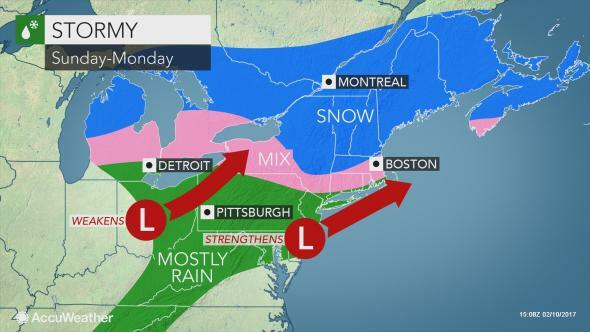 Areas across the northeastern United States that are digging out from the recent blizzard will be at risk for more snow and travel disruptions into Monday. Two storms will take aim at the region. One storm will skirt across the upper reaches of the Great Lakes and Northeast through Saturday. A second, more potent storm will follow Sunday into Monday with the potential for blizzard conditions. A swath of snow will skirt along the leading edge of mild air across the Northeast through Saturday. A general coating to 3 inches of snow is expected from far northern Michigan to New York and the New England coast. Higher accumulations are possible over southern Ontario and southwestern Quebec. Another 1 to 3 inches of snow is in store for Boston by Saturday afternoon after nearly a foot of snow buried the city on Thursday. Given the recent cold, even a small amount of snow can quickly cause a slick coating on roadways. 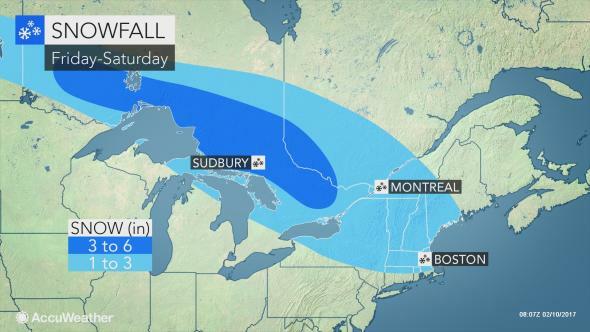 Motorists along Interstate 90 from Syracuse, New York, to Boston, and along Interstate 95 from Boston to Bangor, Maine, should be prepared for slippery spots Friday night and Saturday. The storm will depart by Saturday night but will give way to a new storm that threatens to be far more potent. 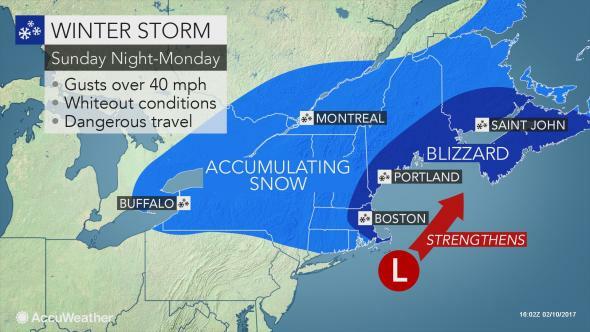 "From Sunday afternoon to Monday evening, another powerful winter storm set to deliver blizzard conditions is on the way for portions of New England hit hard by snowfall this past Thursday," AccuWeather Meteorologist Kyle Elliott said. A storm is expected to strengthen off Cape Cod on Sunday night. Snow and winds will intensify on the back side of the storm. Exactly where the storm intensifies and how quickly it does so will be a key factor in determining the corridor of heaviest snow and strongest winds. 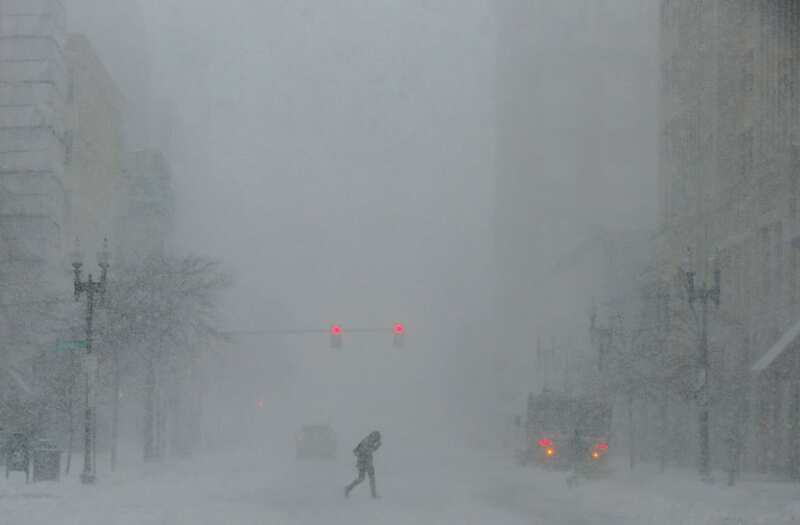 "At this time, it appears that the I-95 corridor from Boston to Portland and Bangor, Maine, will bear the brunt of the storm," Elliott said, adding that over a foot of snow could pile up along this swath. Should the storm strengthen to its full potential, travel will be dangerous, if not impossible, with whiteout conditions and blowing and drifting snow. Major airline delays and cancellations could also occur. "The weight of the snow, combined with fierce, howling winds, will be more than enough to bring down tree limbs and power lines," Elliott said. Portions of interior New England as well as New York could also be in line for a plowable snow from the storm. Downwind of lakes Erie and Ontario, snowfall can be enhanced on the back edge of the storm. Along the corridor from Washington, D.C., to New York City, all rain is in store as mild air takes over. Temperatures will generally be 10 to 20 degrees Fahrenheit higher in these areas Saturday to Monday compared to the end of this week. The weather pattern will remain active across the Northeast through mid-February as additional storms with the potential for snow will target the region later next week.